What Tent Do I Need for My Event? If you’re hosting an upcoming event, you are probably doing a lot of party planning. There’s a lot that does into a special occasion, including catering, decorating, and providing tables and chairs for guests. If you’re hosting an outdoor event, that requires even more planning. To make sure the party can go on rain or shine, consider renting a tent. The following blog post explains what kind of tent you can use for your special occasion. Outdoor weddings, birthday parties, office parties, and so on are fun, beautiful, and refreshing. However, they can also be warm or rainy. Shelter guests with a tent that keeps out the direct sunlight or the rain for a successful party. When renting a tent for your event, there are several to choose from. The first is a frame tent, or a tent without poles. Frame tents provide an open setting that doesn’t obstruct anyone’s view. Next, pole tents have poles through the center of the tent. This is a traditional type of tent that allows for increased decor and an inviting ambiance. Decorate the poles with streamers, ribbons, flowers, or lights for a party all your own. Century tents are the next type of tent, which are large and stand on their own. These tents can also be connected to other tents, offering the most possible space. If you’re having a party with many guests, a century tent is your best option. Don’t forget about tent upgrades! All of these tents are available with upgrades that can best accommodate your event. At Pink Elephant Party & Tent rentals, we have tents that come in a variety of colors, we have tent heaters, and we have sidewalls. 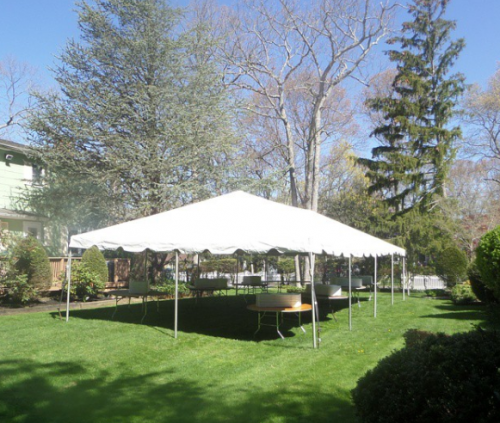 Maintain a private event or shelter guests from wind and rain with sidewalls. We even have tent chandeliers and lights for an elegant and illuminating experience that can keep your party going after sunset. Learn more about the tent rentals and accessories available at Pink Elephant Party and Tent Rentals by visiting our website or calling us at 631-357-3561 today!